I’ll admit it. I was a little miffed when they didn’t include Jabba in the Star Wars stamps put out by the US Postal Service back in 2007. At the time I had no idea that the small African nation of Togo (aka the Togolese Republic) had already put out a Jabba stamp a decade earlier. 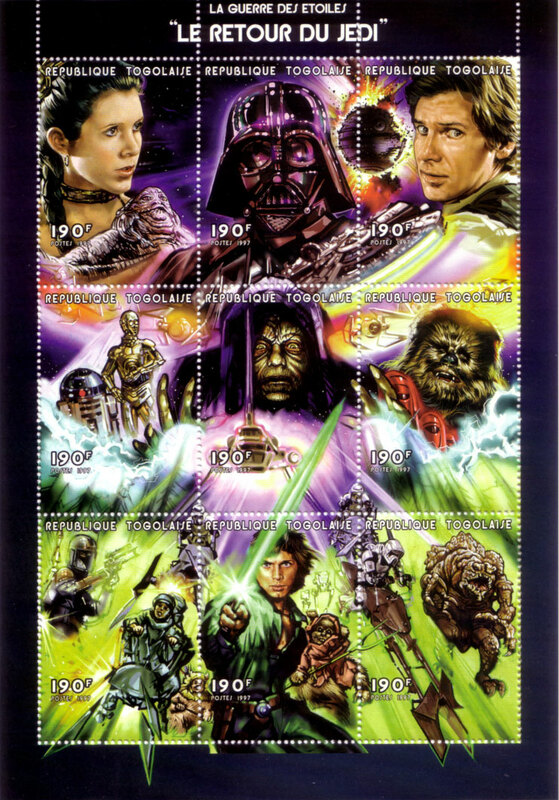 It’s part of a “Return of the Jedi” block of stamps released in 1997. They appear to be unlicensed, and were probably put out by the Togolese government in an attempt to cash in on renewed interest in Star Wars at the time. I’m not even sure if they actually saw a release in Togo, or if they were just printed up and sold directly to Star Wars collectors (mine has a numbered certificate of authenticity that seems to support this idea). But in any case, they’re real stamps that you could presumably use to mail something should you happen to be in Togo. The art on these stamps is kind of uneven. The image of Leia on this stamp is excellent (even if it’s taken directly from a film still) and Jabba isn’t terrible, although he does look strange being so small in comparison to Leia. Almost like a little lapdog or something. But some of the other ones look like quick sketches in comparison. Luke looks nothing like Mark Hamill, the Rancor looks weird, etc. In any case, it’s an interesting piece.